Mill-Max addresses the connector needs of the growing field of LED lighting applications with products such as receptacles and sockets suitable for LED Bi-pin bulbs and interconnects ideal for co-planar mating of LED driver boards. We offer a variety of through-hole and surface mount products suitable for LED lighting requirements. These components are made to the same high quality and precision expected of Mill-Max products. Mill-Max machined pin interconnects are the perfect solution for your specific LED application. 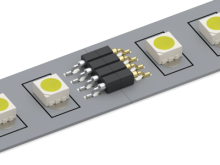 Our horizontal mount headers and sockets can be used for making LED driver board connections, useful for creating a soldered daisy chain connection of two co-planar boards while minimizing any 'shadow effect'. Additionally we offer various receptacle assembly options that accept LED bulb leads conforming to the MR11 (G4 Style) & MR16 (G5.3 Style) base configurations. In addition, Mill-Max offers a full line of low profile, above board and elevated barrel receptacles suitable for socketing LED devices used in lighting applications such as: Portable Lighting, Electronic Signs, Display Backlighting, Automotive Signal Lights, Architectural and Landscaping Lighting, Interior Decorative Lighting and Custom Array Displays. To start your search use our product finder to narrow your options to find the exact configuration you need. We have put together extensive application notes for you to review our standard and custom options to assist you with your design. Download the application notes below for design ideas or contact one of our technical engineers today.